PHOENIX — With Valentine's Day two weeks away, Yelp released its annual listing of the "top 100 most romantic restaurants" in the United States. So, if you still need to make a last-minute dinner reservation somewhere (yeah, we're talking about YOU), this list may give you some inspiration. 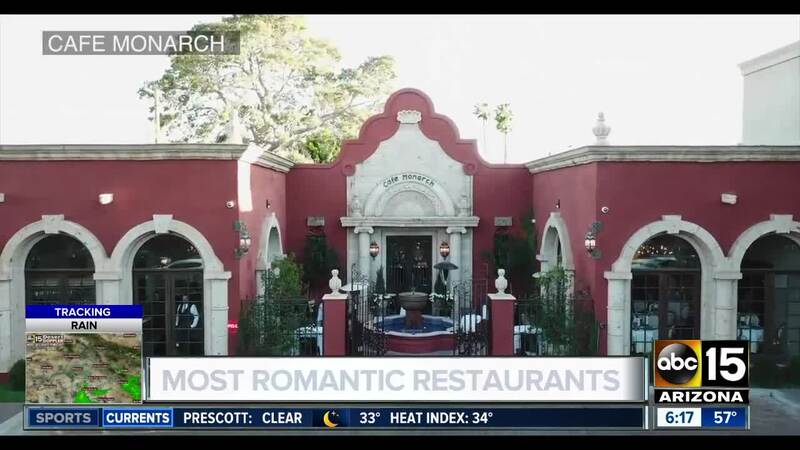 Two restaurants in Arizona made the list: Cafe Monarch (#2) in Scottsdale was named the second most-romantic restaurant in the United States, and Cibo Urban Pizzeria (#19) in downtown Phoenix cracked the top 25. Cafe Monarch is no stranger to these type of lists. It topped the same Yelp list in 2018. The fine-dining restaurant has also been featured on lists curated by OpenTable and TripAdvisor. The same goes for Cibo, who has not only been featured on local media lists, including some of our own, but also Travel and Leisure and Yelp. Last year, Cafe Monarch relocated across the street to a larger building. View photos of the inside . Diners will experience cloth-lined tables and four-course meals. Cibo opened in 2005 within a 1913 bungalow and features exposed brick, hardwood floors, and an outdoor patio illuminated with string lights. Diners will find more than 20 pizzas on the menu, along with pasta, salads, Bruschetta and other Italian dishes. To make its list, Yelp said it identified restaurants that had a "large number of reviews" that included the words "romantic", "Valentine's Day," and "date night." From there, the company looked at the total number of reviews and ratings to determine how high a restaurant ranked. Also, the list was limited to two restaurants per city. Penumbra in Chicago topped the list, and Bavette's Bar & Boeuf, also a Chicago favorite, rounded out the top three. Le Diplomate - Washington D.C.